Give a neat boost to your dull campaign by toasting this customized wine cup shape bottle opener keychain. It will be appreciated and easily accepted by your young qualified customers who are always ready for a toast and neat drink with their friends or other loved ones. It offers large imprint area to position your logo and makes an ideal choice for winery promotions. 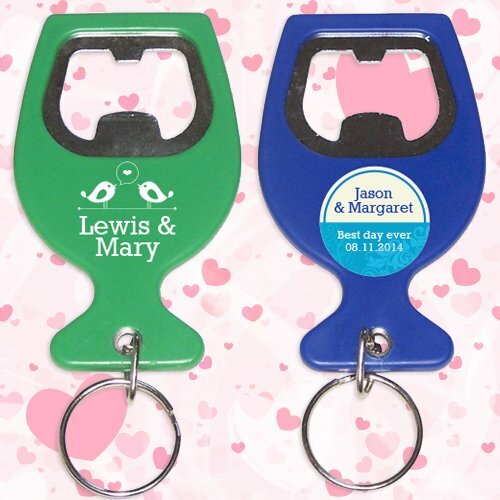 Party supplies, wine parlors, food and beverages supplies and many more can find success with a custom wine cup shape bottle opener keychain. It can be gifted on regular business day or during special marketing occasions. Request a quote to know about your share of savings on bulk orders of this wine cup shape bottle opener keychain. Product Size – 1 13/18" x 3"
Imprint area – 1" x 3/4"
Product Size :1 13/18" x 3"